Statistics reflect that the U.S. Government exchanged and paroled 329,963 "Rebels" and the Confederacy exchanged and paroled 152,015 "Federals." Discussed are Civil War Prisons, aka Prisoner of War Camps, Life and Death in a Civil War Prison Camp, Who were the American Civil War Prisoners, Union and Confederate Prison History, Experiences of a Union and Confederate Prisoner of War Guard and Commandant, and List of Union and Confederate Prisoner of War Camps. Initially, neither the Federal Government nor the Confederacy was prepared to handle large numbers of prisoners of war, nor was there much past experience with the problem. Little was done on the Union side to regularize prisoner of war control until October 7, 1861, when Lieutenant Colonel (later Brevet Brigadier General) William Hoffman was detailed for duty as Commissary General of Prisoners under the supervision of the Quartermaster General. In recommending, on July 12, 1861, the appointment of a "commissary of prisoners," Quartermaster General Montgomery C. Meigs had referred to the previous existence of such an office, when the Government had the care of prisoners of war, kept "the muster list of prisoners," negotiated "exchanges according to the cartel," and sent "funds to the commissary of the enemy for use of our friends in their power." On October 26, 1861, Meigs ordered Hoffman to establish headquarters in New York City and a depot for prisoners of war on Johnson's Island in Sandusky Bay. Earlier, prisoners had been confined principally in the coastal fortifications at New York and elsewhere. On April 18, 1862, Hoffman's office was transferred from New York to Detroit, and on October 7, 1862, to Washington. On June 17, 1862, by AGO General Order 67, Hoffman was made " subject only to the orders of the War Department"--and thus relieved of the necessity to report to the Quartermaster General--and became entirely responsible for the "supervision of prisoners of war sent by generals commanding in the field to posts or camps prepared for their reception." (On March 19 Hoffman had complained to the Quartermaster general that his office was "not known to the generals, and any information I have about movements of prisoners I pick up from the newspapers and other chance sources.") All matters relating to prisoners of war were now to "pass through him," and his general duties, as later clarified by changes in the 1861 Army Regulations, were to be those of an inspector. He regulated the issuance of clothing to prisoners, granted paroles for medical reasons, and controlled the use of funds from ration savings at prison hospitals and stations; and he was required to keep a "full record of all prisoners." (About) The terribly overcrowded Confederate camp at Andersonville, Georgia was the war’s most notorious prisoner of war camp, though not its deadliest. Here captured Union soldiers draw their rations. Credit: Drawing rations; view from main gate. 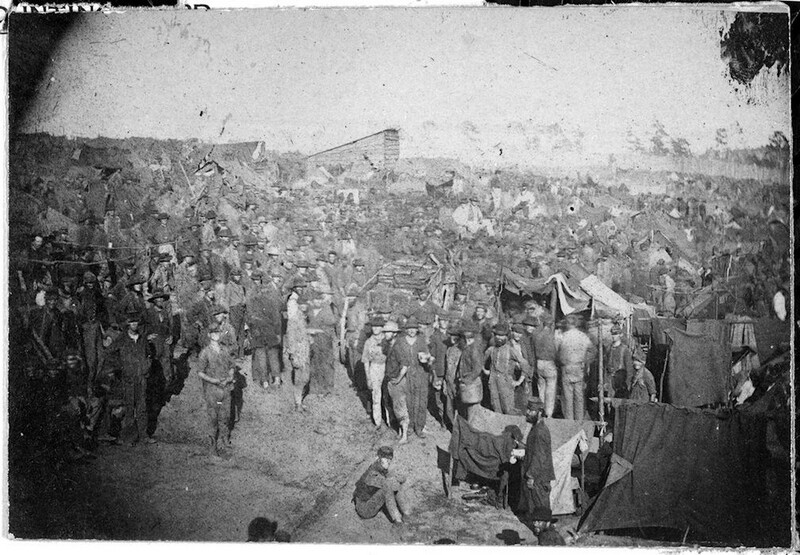 Andersonville Prison, Georgia, August 17, 1864. National Archives and Records Administration, Record Group 162, 165-A-445. Although he received and maintained full records of the prisoners confined in Union prisons, including records of parole made in effecting exchanges of prisoners, the negotiations between representatives of Union and Confederate authorities on prisoner of war exchange were conducted, on the part of the Union, under the immediate supervision of the Secretary of War. The Commissary General of Prisoners had direct charge, however, of U.S. officers and men on parole from Confederate imprisonment and of correspondence relating to them. The reception, care, and ultimate disposition of paroled Union prisoners were carried out at camps especially set up for these purposes; a revealing report of inspection, describing perhaps typical conditions in these camps as well as the records they kept, is printed in the Official Records of the War of the Rebellion, Armies, ser. 2, vol. 5, p. 328-337. Under a basic circular of the Commissary General of Prisoners, July 7, 1862, Confederate prisoners in each camp were divided into companies; and registration, accounting, and reporting were systematized. Rolls accompanying arriving prisoners were required to be carefully checked; if there were no rolls, they were to be immediately made out containing all the information required as correct as can be from the statements of the prisoners themselves." On November 11, 1864, by AGO General Order 280, the functions of the Office were divided. Brigadier General H. W. Wessells was assigned "to duty at Washington as Inspector and Commissary General of Prisoners for the section of the country east of the Mississippi River"; and Hoffman, thus relieved, was assigned "as Inspector and Commissary General of Prisoners for the region west of the Mississippi." Direction of the Office of Commissary General of Prisoners at Washington was, however, restored to Hoffman on February 1, 1865, by AGO Special Order 51. Except for this short period when responsibility for the work was divided geographically, Hoffman served as Commissary General of Prisoners until his relief by Major General Ethan A. Hitchcock on November 3, 1865. Hitchcock, who previously had been Commissioner for the Exchange of Prisoners, remained in charge until August 19, 1867, when the Office was discontinued and its records were transferred to the Prisoner of War Division of the Adjutant General's Office. Confederates still imprisoned at the end of the war were released by stages. Early in May 1865, prisoners below the rank of colonel who had been willing to take the oath of allegiance before the fall of Richmond were released on parole. On June 6, 1865, a release order (AGO General Order 108) provided for the discharge of all enlisted men of the Confederate Army and petty officers and seamen of the Confederate Navy upon their taking the oath of allegiance; and for the discharge of all Confederate officers, of the rank of captain or lower in the Army or the rank of lieutenant in the Navy, provided they were not graduates of the U.S. Military or Naval Academies and provided they took the oath of allegiance. As many as possible were to be discharged daily, and the Quartermaster General was to furnish transportation either by rail or by steamboat to the point nearest the prisoners' homes. In July 1865 the President ordered the release of all prisoners of war except those captured with Jefferson Davis. By October 20, 1865, of more than 96,000 prisoners of war captured and confined by the Union Army, only six remained. In the year following the end of the war, the staff of the office was reduced by about a third. In this immediate postwar period two divisions conducted and recorded the correspondence. A third division handled cases involving Federal prisoners of the Confederacy and was expected to furnish or request "the complete record of each soldier from the time of his capture until his exchange and return to duty with his company." A fourth division maintained and completed the records pertaining to Confederate prisoners of the United States and made numerous reports from them. It compiled, in 1865-66, a "complete index of all monthly returns, post returns, and inspection reports received from the several prisons and hospitals during the rebellion." And a fifth division had charge of claims for commutation of rations due Federal prisoners of the Confederacy. Statistics of the Office reflected that the U.S. Government exchanged and paroled 329,963 "Rebels" and the Confederacy exchanged and paroled 152,015 "Federals." Recommended Reading: To Die in Chicago: Confederate Prisoners at Camp Douglas 1862-65 (Hardcover: 446 pages). Description: The author’s research is exacting, methodical, and painstaking. He brought zero bias to the enterprise and the result is a stunning achievement that is both scholarly and readable. Douglas, the "accidental" prison camp, began as a training camp for Illinois volunteers. Donalson and Island #10 changed that. 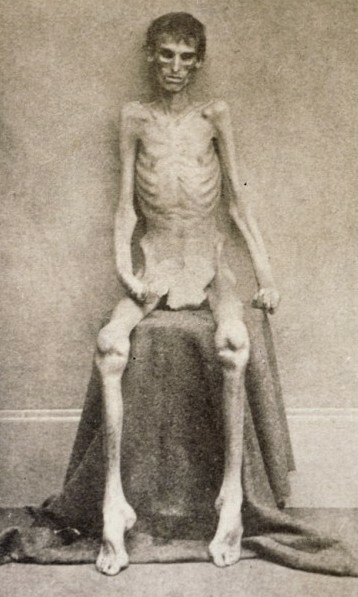 The long war that no one expected… combined with inclement weather – freezing temperatures - primitive medical care and the barbarity of the captors created in the author’s own words "a death camp." Stanton's and Grant's policy of halting the prisoner exchange behind the pretense of Fort Pillow accelerated the suffering. Continued below. Drawing on scores of previously unpublished firsthand accounts, Portals to Hell presents the prisoners’ experiences in great detail and from an impartial perspective. The first comprehensive study of all major prisons of both the North and the South, this chronicle analyzes the many complexities of the relationships among prisoners, guards, commandants, and government leaders. It is available in paperback and hardcover. The writer, "with malice toward none and charity for all", denies conscious prejudice, and makes the sincere endeavor to put himself in the other fellow's place and make such a statement of the matter in hand as will satisfy all lovers of truth and justice.